Governor Cooper today joined a coalition of Atlantic Coast governors from Connecticut, New Jersey, Rhode Island and Virginia to urge Congress to oppose the Enhancing State Management of Federal Lands and Waters Act. In a joint letter, the governors called on congressional leaders to reject the proposal to charge the taxpayers of states opposed to offshore drilling if they want to secure an exemption. “North Carolina should not have to pay a ransom to protect our beaches from the dangers of offshore drilling. Our coastal communities generate more than 30,000 jobs and the risk posed by offshore drilling simply isn’t worth it,” said Governor Cooper. Since the Trump Administration’s proposal to open the Atlantic and Pacific coasts to offshore drilling, bipartisan Governors of coastal states have spoken out in opposition, citing the critical threat posed by drilling to tourism, commercial fishing and coastal economies. The Enhancing State Management of Federal Lands and Waters Act would charge states based on a formula to receive an exemption. Initial calculations estimate North Carolina could have to pay more than $500 million to receive a waiver to protect its shores from offshore drilling. Nags Head Mayor Ben Cahoon is set to testify today against the bill before the House Subcommittee on Energy and Mineral Resources in Washington, DC. For more on that hearing, please click HERE. In the letter, the governors are clear in their opposition to the federal government using the health of coastal economies as leverage to extort money from Atlantic Coast states. “Our constituents have been clear about the need to protect our shorelines: our environment, our jobs, and our economies depend on it. We ask that Congress recognize and respect the rights of states to protect our waters without being held hostage by the combined effects of the Interior Department’s dangerous proposal and this misguided legislation,” the letter states. In North Carolina, dozens of coastal communities and elected officials from both sides of the aisle have expressed opposition to offshore drilling. Last year, Gov. 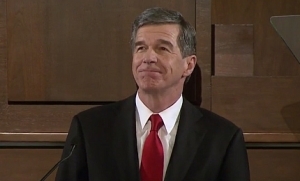 Cooper submitted public comments opposing seismic testing and drilling off North Carolina’s coast and on January 20th, he requested an official exemption for North Carolina in a call with Interior Secretary Zinke. In February, Cooper hosted Zinke along with Attorney General Josh Stein and a bipartisan group of coastal elected officials to express their opposition to drilling off of North Carolina’s coast.